During today's Nintendo Direct broadcast, Nintendo revealed that wireless NES controllers will be made available to enjoy the 20 NES titles which will launch with the Nintendo Switch Online service next week. 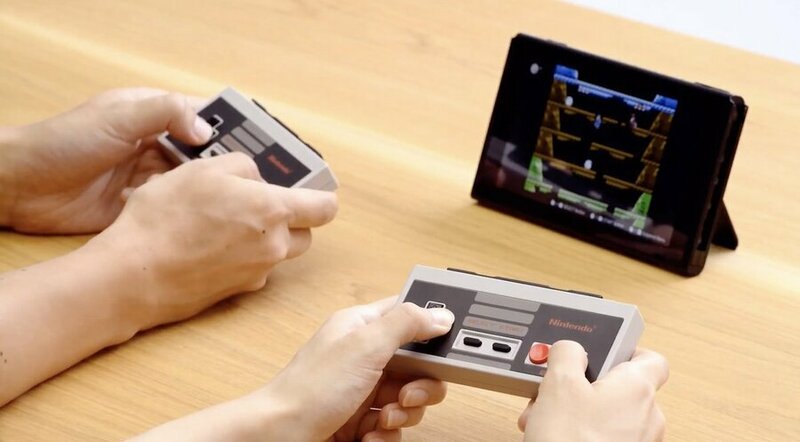 These controllers look to be faithful to the original NES controllers and as they are wireless they will be perfect to play NES games with on the Switch when playing in tabletop mode. The best thing is they can be docked on the side of your Switch like Joy-Con so that you can keep the batteries topped up. How cute is that? 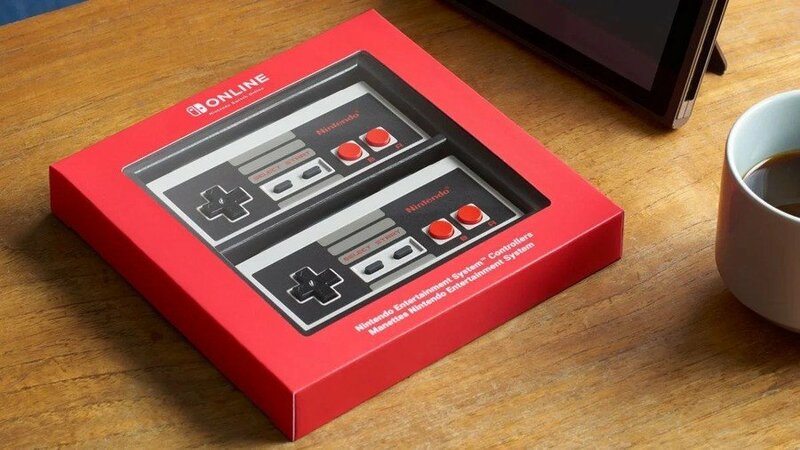 The pair of wireless NES controllers will retail for $59.99, will you be picking up a pair when the Nintendo Switch Online service launches? They look great. I've not seen the direct yet but will the games be available for purchase rather than rentable through the service?! Not into it but I am excited about the Final Fantasy games coming. Look nice, but not for that price. Seems unnecessary. I wish these were somehow compatible with the NES Classic (that cord)! No handheld play = no buy !!! I was hoping for a retro/modern official Nintendo controller,like the 8bitdos,but with HD Rumble and everything.Will stick with my SF30 Pro. Don’t forget the Super NES, N64 and GameCube controllers when those systems come to Nintendo Switch Online. But where is SNES and everything else?! Nintendo is seriously concerning me with them continuously reiterating that Switch Online is only getting new NES titles. @embison and how do you know that? This doesn't preclude any of those games coming to Switch. Yes I would like to get these but it depends how much they are when they release in the U.K, it might be cheaper to get a NES classic and an extra controller! than it would to be buy this. Still good though, especially if they release Snes titles at a later stage. The fact that you can slide them on the side to charge them as joycon is pretty convincing! Expensive. 8bitdo here i come. It's two full functioning controllers how much are the 8bitdo (or whatever) that everybody loves so much? (25 for one and you have to use the 3party dongles and all of that jazz). I'll take the Nintendo branded ones. I would buy 1 for 20 dollars. I have no need for a pair. Want if they work for e shop arcade games. That price is outrageous though. I thought these were awesome. Well you can use the 8bitdo controllers for any game. These are for NES only (and games that only need two buttons and a d-pad maybe). Too expensive for me for what it is. Also as much as it pains me I’m in no rush to get the online service it’s just not good enough for me to pay for that. I came back to say the price doesn't so much bother me as the fact I can't just buy one. I don't need or want two. Switch owners worldwide: "I wish Nintendo would release a joy-con with a proper D-pad." Two controllers for a 3 year subscription price. Yes and well Yes, I think they are awesome and I play my Switch docked way more than portable people are harping on the price it's two controllers that are rechargeable on your Switch personally not a bad price to me can't wait to pick these up. @embison maybe some time down the line... I hope... The concept is a good idea, we fans always want the whole enchilada, but sometimes things need to be tested. Yeah. Stupid idea. You are ironic right? People want d-pad joy-cons for handheld play. Then they release this nonsense, that you can't use in handheld mode. Nintendo is just not listening to their customers. Would have been nice, if you somehow could use these in handheld mode when they are attached to the Switch. Then we would have a deal Nintendo! $60 is a bit much. Cool as hell... But the price? Ridiculous. Dongle?!? Do your research! They work natively like a charm. And they have more buttons and therefore work with more games. And also, I can just buy a single one if I do not need two controllers. It's always nice with some options. That was a wired conclusion to make out of this?!? Nintendo just realized how big the market is for Retro gaming. Of course we will also see SNES titles sooner than later on Switch. Don't be naive! Cool idea but that price tag. I'll just play these games with the Mega Drive controller! I friggin love these. I sure hope there's SNES ones in the works as well. Finally, Nintendo manufactured joy cons with d-pads...that have the majority of the modern buttons removed, near exclusive use for N.E.S. titles, and a price tag of $60. Do I need these? Nope. Will I probably buy them? Yup. Not sure I would use these but man they would look good on display on my joycon / pro charging dock. So an adapter for the Mini consoles' controllers was too much to ask? Already had a fresh mold for these because of the Nes Mini. Kudos Nintendo. The Direct was wonderful. @dres exactly, it's crazy people think Nintendo won't find another way to get people to play their older games, especially on their flagship console. What if I only want one? I don't want two and I don't want to spend £50+ for one with a spare I'll never use. Yikes.....what a ripoff. You can literally buy an entire NES Mini console for the SAME price as this controller set ($60)! It also seems like you cannot even use these for any normal retail or eShop Switch games either. This probably rules out any compatibility/adapters for the NES mini controllers and vice versa. I'm not ripping on the controllers themselves; the NES controller is timeless and still one of my all-time favorites. It's cool that there are official 1st party wireless ones now. But the execution & pricing of the concept are flat-out terrible imo. @embison I actually think the reveal of these basically confirms SNES games are on the way. A week or 2 ago, some data miner leaked an image of controller icons that clearly showed NES and SNES controllers. There's a chance the leaker just took a guess knowing NES games are coming and photoshopped the image but I don't think so.I'd say it's just a matter of time until SNES games arrive. Expensive, but might have paid if I could have bought the nes games. Because they become useless if I don’t renew Nintendo switch online and when the service is discontinued (that will be a long time tough) is a no go for me. No thanks, I'll stick with the NES Classic Edition (which are actually obtainable now). So sounds like these controllers will be useless once Nintendo ends its online service and take down the NES games off with it. Yep, as someone said above these are only available to members. They don't cost much more than 2x 8bitdo NES controllers would. I'm assuming the fact they can charge on your console is where the extra cost comes in. They really should have figured out a way to make them usable in handheld though,definite missed opportunity. I just want to see Bowser play Ghost n' Goblins more. What happens when they release SNES games? N64? GC? Are they going to make overpriced controllers for all of them? I don't think they're planning ahead at all for this service. They look very nice. They charge on the sides, which is nice. They're bigger than the joy-con, nice! That price though, that's not nice. Still haven't found any firm confirmation that these exclusively work only with the NES games. But this will decide whether I get them. Considering I will keep using the Switch mainly as a portable, I wouldn't need these, but it those games need an internet connection to be played and the on-the-go factor goes to hell... then they're definitely not for me. Does anybody know if they will work with other games too? Or just the NES ones? I mean, for instance, Arcade Archives Vs. Super Mario Bros.
Yeah, faithful right down to the very bad ergonomics. I'd rather just play the NES games with the Pro Controller.